Tumble dryers are one of the biggest consumers of domestic electricity. Most people are unable to hang their washing out to dry 365 days a year, but there is an alternative – an ‘old-fashioned’ spin dryer(also spelt spin drier). In a previous article we looked at the energy efficient Spin X Spin Dryer. Here we will look at some of the other spin dryers available in the United Kingdom today. Using a spin dryer prior to putting the washing in the tumble dryer can save a lot of electricity, therefore reducing carbon emissions, and saving money. 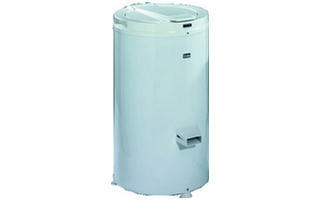 Unlike a tumble dryer, a spin dryer does not use heat to get clothes dry. Instead it rotates the washing at great speed causing water to be spun out due to centrifugal force. By removing the majority of the water from washing with a spin dryer, the time taken to dry clothes in the tumble dryer (or hung outside) is greatly reduced. A typical tumble dryer uses around 2,400 Watts of electricity compared to just 400 Watts for a spin dryer. This is purely because heating the inside of the tumble dryer requires a lot of electricity whereas powering the small motor in a spin dryer does not. Typically, using the spin dryer for five minutes will reduce the time required in the tumble dryer by half an hour. In 30 minutes the tumble dryer will consume around 1.2 kWh of electricity, in five minutes in the spin dryer just 0.03 kWh will be used. Therefore a saving of just under 1.2 kWh of electricity per load can be achieved (saving around 15 pence). A middle of the range spin dryer costing around £100will pay for itself in 666 drying cycles which is 3-4 years for the average UK family (or three to four weeks for anyone with a baby!). NEW Click here to read our new article on energy efficient gas tumble dryers which reduce carbon emissions by half and running costs by as much as 65%. The efficiency of a spin dryer is key, since it should ideally be able to pay for itself within its operational lifetime with electricity savings. In addition, if the aim is to get clothes dry using as little energy as possible, an efficient unit is naturally preferable. Things to look out for when purchasing a spin dryer are the rotational speed – the higher the better (typically around 2,500 to 3,300 RPM), the power consumption, efficiency (spin dryers are typically rated in efficiency class D) and the load capacity. Typically water is removed from the spin dryer by gravity, however more expensive models often have apump which speeds up the drying process. The Creda S202PW has a load capacity of 11lb, and is available for around £100. 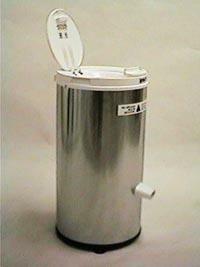 The Creda S102GW spin dryer has a load capacity of 9lb and a spin speed of 2,800 RPM. It is available from around £100. 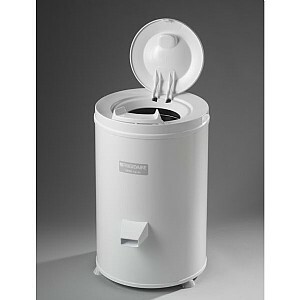 It is in energy efficiency class D.
The Frigidaire FSD28 spin dryer (pictured below) has a 5.5lb load capacity and costs around £75. Spin X. The manufacturers of the Spin X Spin Dryer promise that just two minutes in their dryer will save 30 minutes of tumble dryer time. The Spin X is made in Germany and is currently not sold in the UK. It is however available for $499 in the USA from spin-x.com.